Humans breathe out 18 litres of carbon dioxide every hour. Even though we produce a lot of carbon dioxide, we cannot tolerate high quantities of the gas, and concentrations of more than 1% (10,000 ppm) are toxic. Headaches, tiredness and an inability to concentrate are all symptoms of poor indoor air quality. Official recommendations are that carbon dioxide levels should be a maximum of 1200 ppm, i.e. below 0.12%. In normal buildings, indoor air quality and carbon-dioxide levels are controlled by providing adequate ventilation using fresh outdoor air. As the loading of indoor spaces changes in accordance with how a room is used, ventilation rates given in the building regulations are specified on the basis of each room’s function. Unfortunately, indoor air quality is very often degraded by inadequate ventilation, impurities in the air or as a consequence of building materials being damaged by high levels of moisture. In indoor spaces that contain many people, such as school classrooms, daycare centres and meeting rooms, high levels of carbon dioxide are a particular result of insufficient ventilation. Elevated levels of carbon dioxide are also often present in both bedrooms and offices. Hydrocell offers a solution to this problem. 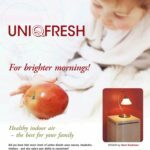 The unique features of the UniqFresh design make it a very effective way of lowering carbon dioxide levels in indoor air and achieving a significant improvement in air quality. Even though excess levels of carbon dioxide is often the biggest problem with indoor air, UniqFresh is the only air cleaner on the market that actually removes it. Other problems that reduce indoor air quality are dust and compounds released by building materials. In urban areas, possibly-hazardous particulate matter is often introduced into interior spaces by ventilation systems. 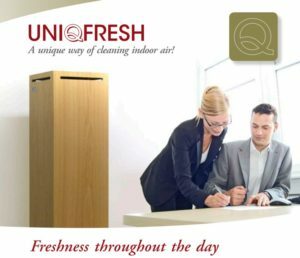 UniqFresh air cleaners have a multi-stage filtration system. Air is first passed through a coarse (G4) filter which removes room dust and pollen. Air is then passed through a HEPA filter which removes almost all the small particles. The final stage in the UniqFresh air cleaner is a specially-designed filter that removes and stores carbon dioxide. The UniqFresh air cleaner removes carbon dioxide and other impurieties from the indoor air, which in high concentrations causes headaches, fatigue, and feelings of stag nation. As a result work productivity is also reduced. For example, in the sleeping area of a day-care centre the carbon dioxide content may exceed 3000 ppm. With an one UniqFresh 400 air cleaner the carbon dioxide level is lowered down to a satisfactory level of less than 1500 ppm. 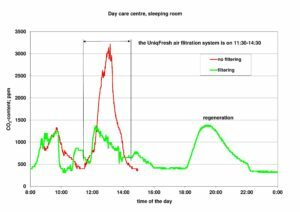 This can be achieved by using the UniqFresh air cleaner instead of ventilation repairs or other measures. Copyright © 2018 Oy Hydrocell Ltd.